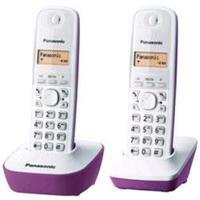 Package includes a set of 2 is inexpensive cordless phones with a one-line display. The phone is equipped with a non-slip finish, which helps to easily mount the device. The unit can be mounted using the wall mount and, thanks to its elegant appearance will surely nice addition to your home.